In a day when I had high hopes that another racist group would not rise up and disgrace the name of Jesus, another one did just that. For those who may be thinking that Christianity promotes racism, it does not. Some who call themselves Christians may try to justify their sinful attitude toward another race and may call racism Christian, but neither the Bible nor the Lord Jesus Christ EVER condoned racism. Racism is not just geared toward one race. I primarily see it against African-Americans and Hispanics, but it has been directed toward other races. I have been told that children who are of mixed races are often unaccepted by both races. This attitude is sickening. 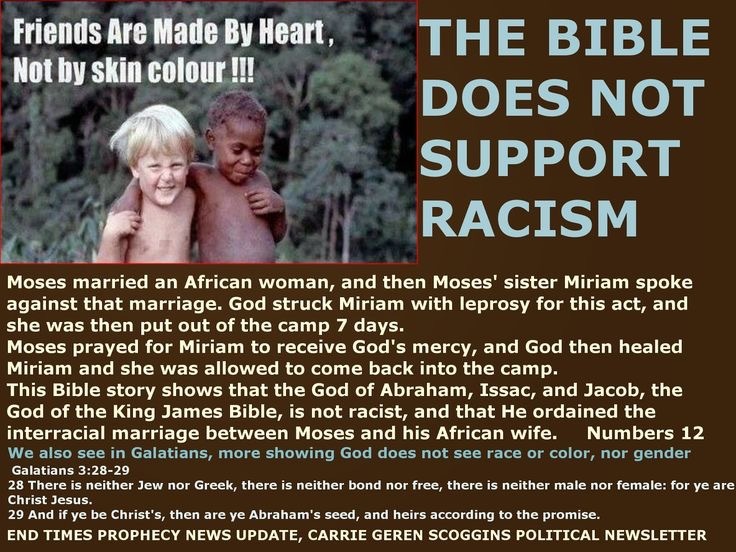 I remember growing up and hearing different people try to twist the Bible to speak against interracial marriages. There is NO Scripture that speaks against it! I know I live in the South and will more than likely be highly criticized for writing this, but the truth is the truth! It is high time that the walls that racially divide us come down. Those who have trusted in Jesus Christ will one day all be gathered together in Heaven and will consist of every tribe and tongue. So why does the Sunday morning worship hour have to be the most segregated time during the week? It doesn’t! I pray daily that God uses our little gathering of believers in Walhalla, SC to break down the racial divide. I’m tired of seeing a sea of one color when I see worship gatherings. I’m ready for the people I pastor to look like a mixed bag of candy. For the record, I want to clarify that racism is sin. God is dishonored by it because He created every human being in His image. God does not discriminate on how a person was conceived, treating someone who was conceived from a one-night stand as less of a person than one who was conceived within marriage. Each person is created by God, and God seeks a relationship with each one. How do we deal with this problem? With love! We don’t need to form a group to rise up against a racist hate group. Hate is not overcome by hate. Scripture says to overcome evil with good. So let’s pray against this wickedness and go spread the love of Jesus to all, especially those who do not look like us. Perfect Scripture for this and all issues of life! When I still had a car, I wanted to go to a black church on the east side of Cleveland because I listen to its sermons on the radio all the time. Unfortunately, I never went because I was afraid of making people uncomfortable. (This was shortly after the Charleston church shooting.) No one should ever feel conflicted like this. (Nor should black people be afraid to be pulled over, but that’s another post for another day.) It’s ridiculous that we’re still discussing such things in 2017. Love – the epitome of who Christ was and is. To love is to know Christ with great intimacy. Is sad all the injustice in the world. Sin separates us from each other and from Christ. As a nation let’s pray and move forward in love. Thank you for posting. Yes, from my experience, bi-racial people are not fully accepted by either side. Occasionally a white person still gets into my face even though I am well into adulthood. Childhood through high school was rough. Other white people might accept me but not sure if most are totally accepting. I have heard some comments in the past “she is nice but not white enough”. Or some would say, “the Japanese girl” like I was from Japan. The Japanese culture would regard me as inferior. Eons back when I was in college, a girl from Japan could not even comprehend the existence of a bi-racial person. We did not communicate after that one day. I am thankful that I have Christ in my life. He is Love no matter who we are. I am thankful that God does not look at color but sees men and women created in His image. In times like Charleston, it is the role of the church to come out and show what side they’re on. Most did, except the Catholics.